Bowls has been played at the Club since 1929. It was initially so popular that for a few years the croquet lawn was turned into a new bowling green to allow for the increased number of bowlers. The Club currently has two world class bowling greens which are available for the use of members and their guests all year round. The greens are used both for competitive and social play. 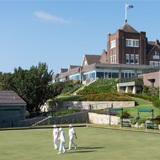 The first bowls match at Royal Sydney was held in 1928. A number of members embraced the game with enthusiasm and between 1930 and 1935 a number of extensions were made to the bowls playing area. At that time bowls completely eclipsed croquet, whose remaining lawn was turned into a new green to accommodate the expanding legion of bowlers. Bowls was initially male-dominated. As late as 1951, the Bowls Sub-Committee was extending a welcome to women who might wish to take up the sport. To that end, a rink was made available on Tuesday afternoons. By then a large number of bowlers were registered. In the 1950s and 1960s the popularity of the game increased and suggestions were made for an increase in the playing areas available and for the improvement of the surfaces. In 1956, one green was sown with bent grass: it remained until the late 1980s, possibly the last such surface in Sydney. The remaining green was re-laid with an improved strain of couch that gave better wear all year round. The current surface of the Eastern Bowling Green is Greenleas Park Couch and for the Western Bowling Green, it is Tifdwarf Couch.